The criminal justice system now serves as the chief provider of health care services to a significant portion of society. This includes the provision of physical and mental health care for offender populations who require substantial health care resources. To date, little is known or understood with regard to how these services and programs are being delivered. This book addresses the gaps in our knowledge by presenting a range of studies detailing the daily practices that occur in places where criminal justice and public health systems intersect. This includes an assessment of sheriff agency emergency communication systems, a study of problem behaviours and health using a juvenile sample, the challenge of treating mentally ill prison inmates with note of important gender differences, the impact of case management on justice systems, and a review of substance abuse cessation programs among pregnant women currently serving probation and parole sentences. Also included is a policy piece in which the authors call for an integrated model that is neither criminological nor public health specific. 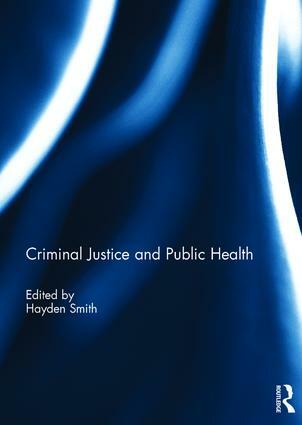 These readings provide a range of empirical examples that highlight important successes and challenges facing the criminal justice and public health systems. They suggest that integration and partnerships represent the most efficacious means to reduce critical social problems such as violence, poor health, and criminality. This book was originally published as a special issue of Criminal Justice Studies. Hayden Smith is an Associate Professor of Criminology and Criminal Justice at the University of South Carolina, Columbia, SC, USA. His principal research focus is the intersection of the criminal justice and public health systems. This includes self-injurious behaviour by inmates, the mental health needs of correctional populations, jail diversion, national standards of care, and premature morbidity and mortality associated with re-entry.